Tending Fire provides a remarkably broad, sometimes startling context for understanding fire. Pyne traces the "ancient alliance" between fire and humanity, delves into the role of European expansion and the creation of fire-prone public lands, and then explores the effects wrought by changing policies of "letting burn" and suppression. How, the author asks, can we better protect ourselves against the fires we don't want, and better promote those we do? Pyne calls for important reforms in wildfire management and makes a convincing plea for a more imaginative conception of fire, though always grounded in a vivid sense of fire's reality. "Amid the shouting and roar, a central fact remains," he writes. "Fire isn't listening. It doesn't feel our pain. It doesn't care-really, really doesn't care. It understands a language of wind, drought, woods, grass, brush, and terrain, and it will ignore anything stated otherwise." We need to think about fire in more deeply biological ways and recognize ourselves as the fire creatures we are, Pyne argues. Even if, in recent times, "we have gone from being keepers of the flame to custodians of the combustion chamber," tending fire wisely remains our responsibility as a species. "The Earth's fire scene," he writes of us, "is largely the outcome of what this creature has done, and not done, and the species operates not according to strict evolutionary selection but in the realm of culture, which is to say, of choice and confusion." Rich in insight, wide-ranging in its subject, and clear-eyed in its proposals, Tending Fire is for anyone fascinated by fire, fire policy, or human culture. "In Tending Fire, Stephen Pyne provides a broader context for modern debates over wildfire in America, examining the history of ideas about fire from ancient times, but focusing primarily on the 19th and 20th centuries. In this probing synthesis, Pyne explores not only the past but the present and future of fire politics, offering options for dealing with fire while recognizing its ecological importance." 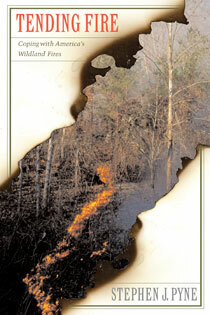 "Stephen Pyne has done more than any single person to shape our understanding of the history and ecology of fire. This volume is a powerful synthesis and application of that understanding for the development of sound policies for the management of fire on rapidly changing landscapes."